Treat cloud service measurement and evaluation as a center of excellence. If you don’t, it could cost you a lot of money down the road. Read more from InfoWorld. Author sfeulessPosted on August 30, 2017 Leave a comment on Why Measure the Cloud? Is Cloud Security Better? Terrible Question. Looking back in time, I mentally divide articles on cloud security into two general “waves.” The first, from the early days of cloud, are those that looked at the shared, public nature of what Amazon was selling and said “the cloud is not yet secure!” In addition to the very idea of shared infrastructure going against everything the security industry was trying to achieve, there were also some quite valid concerns that potential customers needed to know about. Server-based network switching could theoretically be exploited to gain access to VMs that weren’t assigned to you, for example. Data stored in the cloud was not always securely wiped off before the storage space was assigned to new customers, and that made headlines when customers found they could recover information from previous users of the space. CSOs were legitimately concerned about jumping into cloud services too quickly, often citing the need to comply with government or industry security standards like PCI DSS, HIPAA and FedRAMP. The takeaway? Cloud was less secure than your own data center. The second wave of cloud security articles came after the leading cloud providers began publishing long lists of standards that their customers had, in fact, complied with, along with a commitment to support that compliance going forward. The early technical and procedural difficulties were now in the past and relegated to a bin labeled “growing pains.” At that point, the narrative morphed into something new. “All one has to do is look at what the public cloud behemoths spend on security to know that they can achieve far more than your own, sadly underfunded security operation could ever hope to do,” everyone seemed to say. That narrative is still with us today, showing up in security articles and as casual mentions in more general guidance on cloud services. The takeaway? Cloud is more secure than your own data center. Both of these narratives are false. They don’t specify what is meant by “cloud.” Amazon, Microsoft, Google, IBM and all the rest do not secure their cloud infrastructure in exactly the same way. Securing technology assets is way too complex, and security designs are way too proprietary, for that to happen. Data centers are not located in the same places, which means vulnerabilities to disasters or physical incursions vary, as do the political, economic and legal risks associated with the various jurisdictions that cover them. Is that public cloud or private cloud? Because things like auditability and penetration testing are often far more limited when you’re using infrastructure that might be shared with other customers. On-site or off-site? Because if the assets are off-site you’ve almost certainly increased your attack surface by creating an interface with an external entity that has to be trusted, and that entity also has interfaces between your service infrastructure and its corporate network. SaaS providers often use 3rd parties to host their infrastructure, which means you may have added multiple interfaces to your attack surface. Major cloud providers do have world-class security implementations. They have the money to invest, and they know the risk to their business represented by the threat of a well-publicized breach. They better, because they’re also more enticing targets than you would be on your own. Data thieves would love to find a way to get into all the data stored on a large provider’s infrastructure. When thinking about the potential for a criminal act, you should never fail to consider motive. They don’t specify what’s meant by “your own data center.” Who are you? If you’re a small business that has your data center in someone’s converted office and an IT staff that you can count on your fingers, then yeah, large cloud providers probably have better security than you do… as far as it goes. Just remember that OS patches and any interfaces outside the providers’ facilities are usually your responsibility, like the management console that you use to manage cloud resources. What happens when the administrators that can access that console leave the company… in a bad mood… because they quit or were fired? Can all of your backups be deleted from that console? I hope not – don’t forget what happened to Code Spaces. Now, if you’re a large multinational with an IT department as big as a medium-sized company that prioritizes security (I’m looking at you, banks and defense contractors), the answer could be different. You need to look very hard at the provider’s security to determine if it’s a step up, a step down or a lateral move with balancing pros and cons. Do you have unique security needs that can’t be met by a service that’s designed for a horizontal market? You might. Do you have vulnerabilities in your own security architecture that haven’t been closed as the exploits continually multiply? You might. The comparison you’ll need to make will depend in part on who the provider is and on which service you’re considering. Just asking the question can be misleading. It gives customers the impression that when they move to the cloud they are replacing all of their own security with the provider’s security, and for basic IaaS that just isn’t the case. It’s true that the provider has taken on physical data center security, network boundary protection and monitoring, the hypervisor and other security concerns specific to the provider’s infrastructure. They’ve also put in place all of the encryption and configurations necessary for a cloud service to actually operate But you are still doing your own patching. You are still managing the guest OS and all the utilities and applications. You are still doing your own firewall configuration too, even though that firewall belongs to the provider. Many IaaS customers are still surprised when they find out just how little of their security responsibility has actually been taken on by the provider. Now, if it’s SaaS or a “managed” service like database, the picture changes. The provider is likely to take responsibility for much more infrastructure security, and some of your attention can shift upwards to identity management and authentication. It’s critical to pay attention to what the provider is actually taking responsibility for. We’ve only scratched the surface of a very complex topic here, but the next time you see an article that says “cloud security is worse” or “cloud security is better,” I hope that you will give it all the attention it deserves, which is none. 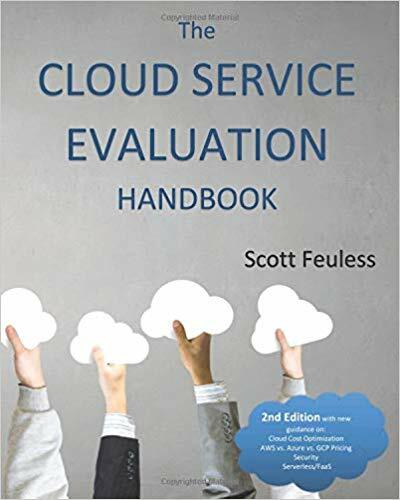 The whole reason that The Cloud Service Evaluation Handbook has an entire chapter on security is that the security that is best for you depends on your needs, your capabilities and on the characteristics of each particular service. You’ll need to do an actual evaluation, with participation from your security team, to find out what you’re gaining or losing when you move to cloud. Author sfeulessPosted on May 22, 2017 May 22, 2017 Leave a comment on Is Cloud Security Better? Terrible Question. But let’s say you’re following those already. You’ve got a good grasp of the application’s workload profile, its needs for disaster recovery, security, response time, elasticity, interoperability and more (see The Cloud Service Evaluation Handbook™), or at least you have people on the team that do, and all of those people contributed to the evaluation of the service that you finally chose. You’ve definitely gotten off to the right start, but costs can still spiral out of control even if they were optimal on day one. The key to making sure that doesn’t happen is taking a variety of steps that fall under the heading of good Demand Management. Oh sure, you might think you’ve got that covered if you’ve been doing IT Demand Management for your private, non-cloud assets. Let’s say you already require strong business cases for new acquisitions, you monitor and improve the accuracy of those business cases, you make sure that old equipment and software licenses get reused to meet new requirements or get properly decommissioned, making sure they don’t continue to generate unnecessary costs in the form of management fees, software maintenance, etc. If you’re doing those things, pat yourself on the back because many organizations weren’t doing them very well even before cloud came along. Now for the bad news: there’s a lot more to good demand management with cloud, particularly public cloud. First of all, it’s more important now than it ever was. An unused server sitting around in your own data center may not have been a big deal if you didn’t need the space for anything else. In the cloud, however, you’re paying for that unused resource every month, just throwing money straight out the window. The “usage” that cloud providers measure when they create your invoice is determined by the number and type of resources that you, the customer, have allocated to yourself. It’s not what you are actually using to do useful work at the moment, and financial people are sometimes surprised by that. Since the providers make more money when you over-allocate or forget to turn something off, you can’t expect them to do much to help you. Even when they provide tools that let you see where your issues are, it’s still up to you to use them diligently to keep your charges down. Here are a few leading practices that you can use to optimize costs. If you aren’t already using them, you could easily be overpaying by 20% to 50% or even more. Reassess your service decisions continually. Application workload characteristics change, and the service you chose initially was greatly influenced by what you expected those characteristics to be. You may have selected on-demand instances thinking that your application could release them most of the time. Is that what you’re seeing? Does your application even have the ability to release resources automatically, or would you benefit from a simple tool like ParkMyCloud that lets you deactivate them on a fixed schedule? Or you may have selected dedicated or reserved instances thinking that workloads would be fairly steady around the clock, and that may be true for some of them, but now that the workload has grown, perhaps some of the resources aren’t needed during off-peak hours. Would going to an on-demand scheme for some of them save money? If usage is very light and it’s the right kind of application, perhaps a FaaS solution like AWS Lambda, Azure Functions or Google Cloud Functions would now be a better choice, or even a Google “preemptible” VM. Reassess your configuration choices continually. For the same reasons that your service choice may no longer be optimal, your configurations are even more likely to need re-optimization as time goes on. Memory requirements, in particular, can change quickly. Performance bottlenecks will force you to go to instances with more memory if you need to, but there can also be opportunities to go to smaller memory configurations to save money. Your developers can and should be looking for ways to make your applications more efficient, and money saved on your cloud bill is the measurable payout for that, not only from charges for VMs and storage but for data transfer as well. Look for “zombie” resources continually. Zombies are resources that aren’t being used because they’ve become “unattached” or simply aren’t needed for running your applications. Storage volumes not attached to a compute instance are common examples, and you may be paying for the entire capacity even though you’re storing nothing on it. For IaaS, IP addresses, databases, load balancers and even VMs can all be zombies. One of the great things about cloud is the ability to try out ideas and then abandon them without making a large investment in infrastructure first, but zombies are a natural consequence of that. Also, if you aren’t currently “tagging” your resources, start now. You’ll want more tags for reporting purposes, but an Owner tag is critical for determining which resources are really zombies before you deprovision them. User accounts can also become zombies when employees leave or change jobs or when trading partners change, so this is important for SaaS as well as IaaS. Inactive accounts represent security risks as well as unneeded costs. Use your tools to detect resources with low utilization and investigate them. Keep doing Hierarchical Storage Management and Information Lifecycle Management, continually. They are still relevant in the cloud, perhaps even more so when the equipment is off-site than when you owned it. Cloud automation makes using lots of storage very easy, and those monthly charges are just going to keep coming until you do something to turn them off. Old snapshots may be okay to delete when you have enough newer ones. Back in the days of mainframes we used to periodically look at the last access date on every file and archive anything that went too long without being touched. In the cloud, you have numerous options on where to put your data, and some are orders of magnitude less expensive than others. Migrating data to options with lower redundancy, lower IOPS, magnetic vs. solid state, “infrequent usage” tiers, long-retrieval-time services (e.g. AWS Glacier), and, of course, deletion are all potential ways to save money. Look at opportunities to refresh your infrastructure, You may be thinking “Wait a minute! I thought cloud got rid of the need for us to do that!” Well, sort of. You may not have to rack and stack new boxes anymore, but you also don’t want to keep paying for your provider’s fully depreciated old equipment unless it has some unique feature that you still need. There’s a common misconception out there that the rapid price drops in the public cloud market are automatically passed on to customers, and, as we’ve discussed previously, that often isn’t true. First of all, they aren’t coming as quickly as they used to, and when they do they may only be implemented on new resource types, so if you don’t refresh the resources you’re using with the newer technology, you get zero benefit. How price changes take effect is entirely up to the provider, however, so it’s up to you to analyze pricing on every new configuration they release to see how it’s relevant to you. Now, the good news is that there are tools to help with all this. Cost optimization tools are often incorporated in Cloud Management Platforms and help with all the things I’ve mentioned above. If you have a large cloud investment I’d expect the business case for one of them to be compelling (e.g., CloudHealth, Cloud Cruiser, Cloudyn, Cloudability, Cloudamize, Rightscale and more). CloudHealth, in particular, has been good about sharing their wisdom on this topic. So, what’s the Third Law of Cloud Cost Optimization? Author sfeulessPosted on February 2, 2017 February 2, 2017 1 Comment on Lambda or EC2? How to Use Them to Save the Most Money.